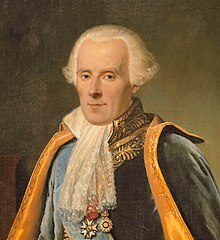 Pierre-Simon Laplace (1749–1827). Posthumous portrait by Madame Feytaud, 1842. "Laplace, Pierre (1749–1827)". Eric Weisstein's World of Scientific Biography. Wolfram Research. Retrieved 2007-08-24. "Bowditch's English translation of Laplace's preface". Méchanique Céleste. The MacTutor History of Mathematics archive. Retrieved 2007-09-04.